It would probably be easy to develop a few hundred bullet checklist of reasons that Democrat Mark Warner is set to trounce Republican Jim Gilmore in this November's election to fill the Senate seat vacated by retiring Senator John Warner. Let's go with two simple reasons -- Warner can play to the middle. Gilmore must play to the right. Warner's first campaign ad, which launches today, demonstrates his strategy clearly. It features one of Virginia's senior Republican statesmen, state Senator John Chichester, touting Mark Warner's fiscal prowess. It is a clear indication that Warner isn't looking for a three point win. He's looking to crush Jim Warner by double digits. And he'll do it by luring Virginia's Republican traditionalists -- the ones Gilmore pissed off when he left Virginia's finances such a mess as governor, and the same ones who found themselves impressed with Mark Warner's prudent approach to governance. He'll add that 15% to his solid base of Democrats and moderates. Gimore, on the other hand, received a strong signal from Virginia's Republicans when he was nominated to run by a squeaker today. From the Associated Press: Gilmore got only 50.3 percent of the delegate votes Saturday over conservative Bob Marshall, the Virginia General Assembly's most ardent foe of abortion and gay marriage. Guess who Gilmore has to curry favor from if he wants to even nudge the 50% line this fall? In his quest to keep the social conservatives in his corner, Gilmore will quickly lose what support he has in the middle. Good luck, Gilmore. You're going to need it. 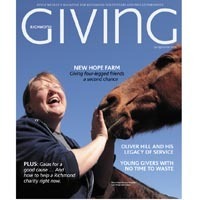 I had my doubts about Style Weekly's new biannual publication, Richmond Giving. Past tense. I picked up the spring/summer issue today and was pleased as punch to see a brief feature on three folks who take old bikes, refresh them and give them to area kids; a lengthy essay by the daughter-in-law of civil rights lawyer Oliver W. Hill; and several pages of information on local organizations and their specific needs. Make it quarterly. It has never actually occurred to me to leave it to Harry Kollatz to make the best, most succinct statement on regionalism I've heard to-date. "The Dillon Rule tradition must die. Enough of playing “Mother, May I” with the General Assembly," Kollatz writes in the latest issue of Richmond Magazine as part of the "Richmond Magazine Regional Reality Check." The older, first-ring suburbs of Henrico and Chesterfield are seeing the same decline that the city experienced during the 1960s and 1970s when both the white and black middle class left the city. Today, just more than 50 percent of the region’s residents living in poverty are in Henrico and Chesterfield, whereas the city historically used to have the higher concentration. “This is why regionalism is critical,” University of Richmond urban-planning scholar John Moeser says. “Poverty and affordable housing aren’t just a city problem anymore. Capital projects are good, but building buildings doesn’t address the issues of employment, job training and education." With six seven potential candidates [Jackie Jackson is mulling re-entering with Wilder out of the mix] in the race, you figure someone might actually be inclined to discuss the issues. Hello, Paul Goldman. Richmond.com continues its "Meet the Candidates" interview series with a Q&A with Goldman, who spent much of his political career orchestrating Doug Wilder's political career. Now he's attempting his second personal foray into electoral politics with schools and government waste are at the top of his agenda. I'm the only candidate with a proven record, documented in books and stories, who has been willing to lead the fight for fundamental change in Richmond, whether helping to lead the fight to give African-Americans and women a chance to be all they can be in our policitcal system or taking the lead in making sure Richmonders got their right in 2004 to elect their mayor. I have a proven record of doing it not to help myself get elected to anything but because it was the right thing to do and somebody had to step forward to do it when others wouldn't. That's what's needed today: people who are willing to make the effort for fundamental change that we need in Richmond. That is why I'm only going to serve one term because I don't want there to be any question that I'm focusing strictly on the kinds of things that need to be done. So I want to be free of any political concerns that are involved when seeking election. A spate of polls in recent weeks have suggested a pretty tight general election race between McCain/Clinton or McCain/Obama. A new meme has been bubbling out of the Clinton camp that she is a stickier candidate for the Democratic base, plus moderates. But a new Zogby International poll suggests that Barrack Obama may well be the stronger general election candidate. Zogby gives Obama a 10-point lead over McCain in the general election, while McCain and Clinton are running virtually neck-and-neck. That's the difference between a message of change and a message of more of the same. Democrat Barack Obama has sprinted out to a 10-point lead over Republican John McCain in a four-way presidential contest including Libertarian Bob Barr and Liberal Ralph Nader, the latest Reuters/Zogby telephone poll of likely voters nationwide shows. Obama does well among his Democratic base, winning 79% support – an indication that the party faithful may be coming together behind his campaign as a bruising nomination campaign nears the end. He also does well among non-aligned voters, as independents favor him over McCain by a 48% to 32% margin. Obama leads in the East, the West, and in the South, while the two are essentially tied in the central part of the country, including the Midwest and the Great Lakes region, the poll shows. He leads among all voters under age 65 – including by huge percentages among those voters under age 30 - but trails McCain among those older voters by a 45% to 34% margin. Interestingly, Obama holds a 13-point edge among those voters age 50 to 64. The Downtown Plan: Four More Years! Richmond's Planning Commission voted yesterday to move further consideration of Richmond's proposed Downtown Plan out another 60 days to allow time for additional public review. Since a number of changes in the plan apparently didn't get into the hands of the public until late last week, there's some sense in the delay. Let's watch as the planning commission does what government in Richmond does well -- use listening as a form of decision making; consider incremental adoption as a tool for consensus building; and avoid dealing with the hard choices that come with a strong vision for the future. Besides, if you're going to ask more than 60 members of the public to carve time out of their busy work day, for the love of all you hold dear don't bother to make it worth their while. That was when I was getting bored. The 5th Floor Conference Room at City Hall was packed beyond capacity for what was billed as the last planning commission hearing on the proposed plan before it went to City Council. More than 60 people showed up. Hardin covered the highlights; readers of the revised plan will see dozens of minor language revisions (many reflecting a less adversarial tone as it relates to Virginia Commonwealth University) and a handful of more significant changes. "In a very general sense we have done a cleaning, so to speak, of the document," Hardin told the commission, "to clear up errors ... we've also addressed the tone." Moving up in priority in the plan is the document's attention to and recommendations related to basic infrastructure maintenance (things like street trees, benches, public trash cans); a new emphasis on the arts and cultural community's role in downtown development; a clearer recommendation for an Architect for the City. "It was also important to clearly outline the advantages and disadvantages of one-way versus two-way streets," Hardin said, nothing that the plan for street conversion spanned 20 years. Another big change was related to Form-Based Code, a process that streamlines and simplifies the current zoning process. The commission's chairman, Robert Mills, told the crowd later in the meeting that the commission was in full support of FBC but was not willing to make a wholesale change without a pilot approach to help the city best understand how FBC would work in Richmond. Hardin said the Manchester district would likely be the first neighborhood where Form-Based Code would be implemented, though on an optional basis. Two other significant changes dealt with large tracts of riverfront land that had been centerpieces of the plan -- Mayo Island, which the original plan targeted as green space with some recreational space, and the former Tarmac property, where plans to develop a private marina and condominiums had run into opposition. The new revisions offer multiple scenarios for both sites -- green space, green space with some development and more developed blowouts. What seems an obvious attempt to placate the development community frankly seems to muddle the picture, and cloud the plan's strong vision for the James River. Ralph Hambrick, professor emeritus at VCU and a member of the James River Advisory Council, said as much during the public comment period. "One of the great concepts that have emerged in the past few years is the concept of the James River as Richmond's great Central Park," Hambrick told the commission. "I am concerned that these revisions might represent a whittling away at that vision." It was when the hearing shifted from presentation to public comment that it became clear that the commission had little or no intention of moving the proposed Downtown Plan forward to City Council. The idea that the plan was going to gather dust for a few more months took on extra energy as lawyers representing New Market (property owners of Tredegar, Gambles Hill and Ethyl (along the James just east of Belvidere) and Dominion Power were joined by a representative of the family that owns most of Mayo Island and several representatives of the Shockoe Bottoms merchants association pleaded with the commission to defer a vote. "This is a critical document and you've all worked hard on it," said Richard Stotz, a member of the Shockoe organization. "We have real concerns, I have real concerns about the implementation. We've come this far. It seems we ought to get it right." The planning commission will bring the document back for consideration in July. As a result, it is likely not to reach City Council for a vote until October -- which realistically pushes its adoption out past the fall election. Thanks for the inspiration, Brie. Last night, the council introduced amendments that have the net effect of reducing Mayor L. Douglas Wilder's proposed budget by about $3 million, from $658.1 million to $655.1 million for fiscal 2008-09. The changes highlight controversies that have made headlines for months. They would scrap all automobile allowances for city employees, slash by nearly half the budget of the mayor's press secretary and force a reduction in spending by the offices of the mayor and the chief administrative officer. They also would cut $1 million from what had been budgeted as a profit on fleet operations and $1.6 million on the amount available for the procurement of goods and services. City audits showed both areas as ripe for cuts. City Council President William J. Pantele said the amendments are designed to reform city spending practices "as best we can from the legislative side of the budget." Please embrace collaboration over confrontation, consensus-building over petty bickering. Extend your reach, vision and attention beyond City Hall. We need a mayor who will attack our infrastructure shortcomings, including the appalling chasm between urban and suburban school facilities. We need an advocate for alternative forms of transportation and truly regional mass transit, and an architect of a cohesive plan for a Balkanized region. We need a mayor who will protect our most precious asset, the James River, while ensuring access to the river for all. We need a mayor who will lead by an ethical example, not one who preaches austere while practicing lavish. Finally, we need a leader with big-picture vision. If a face could launch a thousand ships... oh, sorry, I was lost in a bit of 1970s musical reverie. Yesterday, Paul Goldman took a jab at fellow candidate Robert Grey, as reported in an awkwardly written piece in the Times-Dispatch that used a list format that felt like disjointed writing until I read it the third time. The mayoral candidate spelled out his three-part concern during a news conference yesterday outside City Hall. If local businessman Robert J. Grey Jr. formally announces he's running for mayor. If Grey sticks by his support of an appointed school board (he was one of 26 business leaders who last summer signed a letter about ways to improve city schools). And if Grey wins the mayoral election, Goldman is worried that Grey will attempt an off-year referendum to change the system. "He's taken a confrontational approach to solving our educational problems," Goldman said. Goldman said his fear is that Grey would take advantage of a state law that allows localities to pursue referendums on their school boards. Unlike the law governing the switch to an elected mayor, the school board referendum would not have to be approved by the General Assembly.